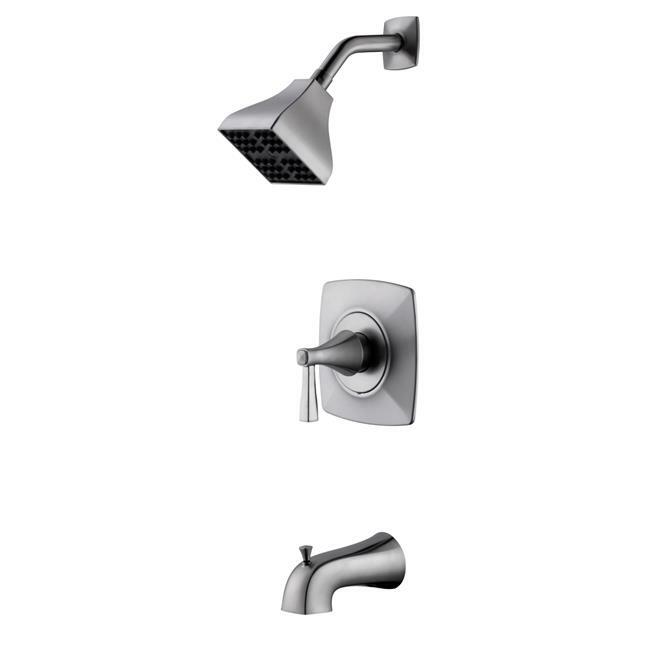 The Design House Perth Tub and Shower Faucet features a single handle design to easily adjust the temperature in your bathtub or shower. Finished in stylish satin nickel, this faucet set is both refined and elegant. The pressure balanced valve helps ensure a consistent water temperature, even when there are pressure fluctuations in the hot and cold water supply lines. This faucet has an ABS shower head and a durable ceramic disc cartridge. The 2.0-gallon per minute flow rate at 80-PSI ensures a steady water flow for years of everyday use. The Design House Perth Tub and Shower comes with a lifetime limited that protects against defects in materials and workmanship. Design House offers products in multiple home decor categories including lighting, ceiling fans, hardware and plumbing products. With years of hands-on experience, Design House understands every aspect of the home decor industry, and devotes itself to providing quality products across the home decor spectrum. Design House uses industry leading merchandising solutions and innovative programs. Design House is committed to providing high quality products for your home improvement projects.